The Spaniard has been named as Nottingham Forest’s new manager. Karanka has been out of work since March of last year. NOTTINGHAM FOREST HAVE appointed Aitor Karanka as their new manager on a two-and-a-half-year contract, the English Championship club announced this evening. The Spaniard succeeds Mark Warburton, who was sacked at the end of last month, and takes over with two-time European Cup winners Forest currently 14th in the second tier. “We are very pleased to have reached terms with Aitor Karanka to become the manager of Nottingham Forest,” said club chairman Nicholas Randall. Academy boss Gary Brazil has been in temporary charge and oversaw Sunday’s 4-2 victory over holders Arsenal in the third round of the FA Cup. “I want to thank Gary Brazil, his staff and the players for their professionalism and loyalty in the last few days,” said Randall. Karanka, who worked under Jose Mourinho at Real Madrid, has been out of work since he was sacked by Middlesbrough in March as the club unsuccessfully battled against relegation from the Premier League. It was the 44-year-old who got Boro back into the top flight during his three-and-a-half-year stay on Teesside and it is those Championship promotion credentials which have appealed to Forest’s Greek owner Evangelos Marinakis. 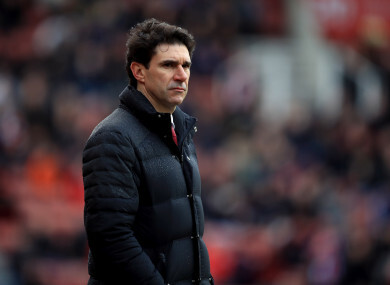 Forest are currently 11 points off the play-off places and Karanka’s first game will be at home to fellow former European champions Aston Villa on Saturday. Email “Ex-Middlesbrough boss Karanka back in English football ”. Feedback on “Ex-Middlesbrough boss Karanka back in English football ”.